‘…The Word-Book is just as remarkable but in this case, it is remarkable for the amazing detail that is presented…’ —Elsevier SYSTEM Journal (2010), Robert Vanderplank, Director, Language Centre, University of Oxford. the House, the Town, Illness, the Weather, etc. Horses, Firearms and Target Shooting, Finance and Business, Nautical Matters, etc. with distinctions that are hard to find in a dictionary. ‘…remarkable for the amazing detail that is presented. …Again, the Motoring section would have come in very handy many years ago when I broke down in France and the mechanic did his best to explain that a rotule had broken and I also had problems with an amortisseur. It’s not often you come across la crémaillère (steering rack) either though, again, it would have helped me in Morocco after an encounter with a large stone. H-T-R-’s Foreword stresses that the Word-Book meets the need for "the real things we see, do, read about, and talk about in the everyday life of this strenuous, practical and mechanised age" (p.vii). Planes, boats and trains are all there, as are the post and telephone. Television and computers make no appearance, of course, but just about everything else is present in this handy paperback.’ —Elsevier SYSTEM Journal —International Journal of Educational Technology and Applied Linguistics—review by Robert Vanderplank, Director, Language Centre, University of Oxford (2010). 'It is a book unique of its kind, and if anybody who has occasion ever to speak French is content to do without it, then he is either a perfect French scholar—or else very conceited!' —Truth Magazine (1929). 'Brighter French … is your ticket to gay Paree.' —Evening Herald (2011). 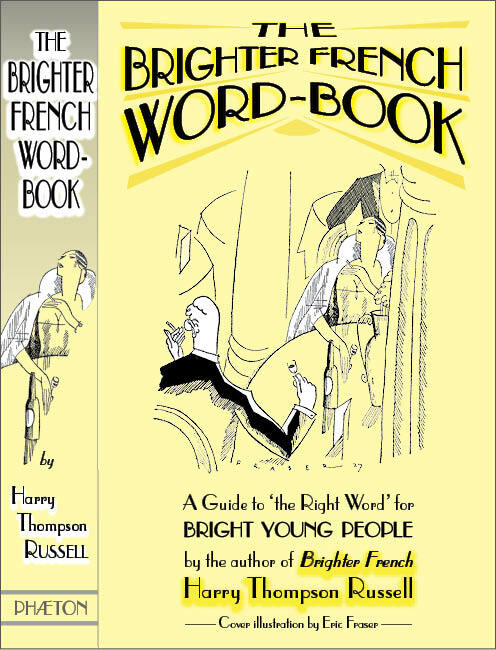 Volume II in the classic Brighter French Series, first published in 1929 as "a Guide to 'The Right Word' for Bright Young People." This new edition (with additional notes, & taking account of French Spelling Reform of 1990, etc. ), is illustrated with images from the cinema of the pre-war period. Ces ouvrages ont le mérite de servir également à l'usage des francophones et des anglophones ! —Equally suitable for French or English speakers !